Very early in this spin-off of director Steven Soderbergh's trilogy of movies about George Clooney's ultra-smooth, ultra-smart thief we are introduced to what is and arguably always has been the most fascinating thing about these movies not to mention heist and/or crime dramas in general. This being the fact that the type of people who find themselves in such scenarios have enough self-confidence and charisma to be able to pull-off whatever facade they wish to carry. It's not about what you may or may not be hiding on the inside or what you know about yourself that you believe everyone who sees you immediately assumes as well, but more it is utilizing your appearance, age, and swagger (or lack thereof) to allow those who see you to make those first, quick assumptions only for you to then deliver upon them so as they don't think about you again. It is an awareness of sorts that Clooney's character never fully utilized, he was always the cool guy in the nice suit, but it is almost immediately that his sister, Debbie Ocean, as played by Sandra Bullock utilizes this tool. And then she uses it again. And again. Hell, if her character's tastes weren't so expensive she could make a fine enough living as a salesperson given the way she is able to adapt to and go with whatever environment she finds herself in and whatever people she finds herself in front of, but this is a movie that is meant to both continue the Ocean's legacy while expanding on the diversification of those gender and ethnic gaps that are being actively addressed in Hollywood as of late. Whether you are in support of this or moronically opposed for one reason or another this agenda doesn't really factor into the execution of the film save for one very pointed line of dialogue that is delivered in such a fashion so as to provide reasoning if not necessarily a justification for this movie's existence. Whether this was an Ocean's movie or not though, what gives the film its pulse is this throughline idea of knowing how to interact with people by scanning them upon meeting them and figuring out what type of person they want in their life and immediately becoming that person. Bullock and a few of her co-stars are able to explore this in a few different ways, but it is mostly Bullock who presents a surprisingly layered approach to this train of thought as we see her Debbie battle with how long such a lifestyle can remain exciting as masked by intentions of justice and vengeance. It's a shame the movie itself doesn't follow through on these instincts as the movie Bullock presents us with and allows us to assume Ocean's 8 might become is far more fascinating than the fun, but ultimately derivative one it ends up being. Debbie Ocean (Sandra Bullock) reunites with her partner, Lou (Cate Blanchett) after being released from prison. 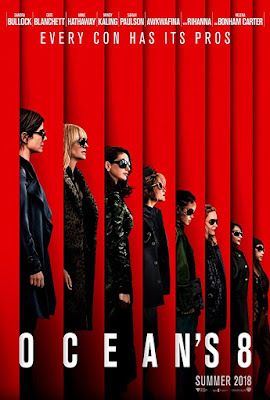 Directed and co-written by Gary Ross (Pleasantville, The Hunger Games) along with Olivia Milch (Netflix's Dude) Ocean's 8 does what it needs to do to fit into the style and tone of Soderbergh's world (overcompensating in this aspect to some degree), but it is clear that while having to fit into this certain niche style that Soderbergh re-invigorated for his 2001 re-make of the Frank Sinatra/Dean Martin film Ocean's 8 also wants to be its own thing. It wants to prove it can do something just as well as the boys while putting its own spin on things and it mostly succeeds in being good fun finding fault not in what it presents or who it is presented through, but more in the inability to capture the energy if not the spirit of Soderbergh's films. This is glimpsed largely through the editing and pacing of the first act of the film as Ross' picture struggles to gain its footing after what is both an impressive and nearly flawless opening sequence that introduces us to Bullock's lead character and perfectly encapsulates who this woman is and how she operates. After this initial introduction the film has an obligation to then introduce the remaining seven members of the crew though, and does so by next presenting the audience with Cate Blanchett's exquisitely dressed Lou (Cate Blanchett) or who amounts to be the female version of Brad Pitt's Rusty Ryan in that she is an expert con artist who has connections out the wazoo, but is largely a part of the group because she has the balls and that aforementioned confidence and swagger to do things most people wouldn't be willing to risk. Bullock and Blanchett make a formidable duo and thus is the reason they seem to so quickly be able to round-up the likes of their hacker in Nine Ball (Rihanna), their low-key thief and pick-pocket in Constance (Awkwafina), their jewel expert in Amita (Mindy Kailing), a fashion designer on the fringe who gives them an in to the world they're attempting to hijack, Rose Weil (Helena Bonham Carter), as well as fellow con-artist, thief, and all-around criminal aficionado Tammy (Sarah Paulson). It is in this extended montage of sorts that the film is either unable to find its footing or becomes one of those "this happens and then this happens" type of stories and it's hard to decide which it is as Ross and Milch's script certainly seems to know what it's doing and how it's going to go about making things happen, but it never feels as if the movie really takes advantage of all it has available to it in a fashion that is genuinely exciting or compelling. It's just kind of there. The heist at the center of the film revolves around New York City's star-studded annual Met Gala event. After a long five years, eight months, and twelve days in prison Debbie has concocted what she believes to be a perfect plan for how to lift what is known as the Toussaint Necklace. A six-pound, 136.25 carat blue-white diamond piece worth upwards of $150 million, the necklace has been buried deep within the vaults of Cartier at their home headquarters in Paris for some fifty years, but given the theme of this year's gala dealing in European royalty and the history of the piece having been worn by such Debbie believes that with the right combination of designer and celebrity they can convince the luxurious jewelry company to allow the priceless piece out of their hands if not their sight for a single night. Enter Bonham Carter's Rose who is something of a relic of a fashion designer that can't help but to dig herself further and further into debt in an effort to resurrect her career. She is the perfect mark for Debbie and Lou to bring into the fold and make promises to while at the same time having to unwittingly convince this year's honorary event day chair, actress Daphne Kluger (Anne Hathaway), to choose Rose as the designer that will dress her for the event. It seems a lot of holes to jump through and a lot of trust to extend which would seemingly make some of Bullock's dialogue rather bullish considering how confident she is in her plan, but alas Debbie and Lou are able to convince Rose and in turn Rose is able to convince Daphne rather quickly and successfully that, despite her current reputation, nostalgia is in and she's the perfect unexpected choice for Daphne. 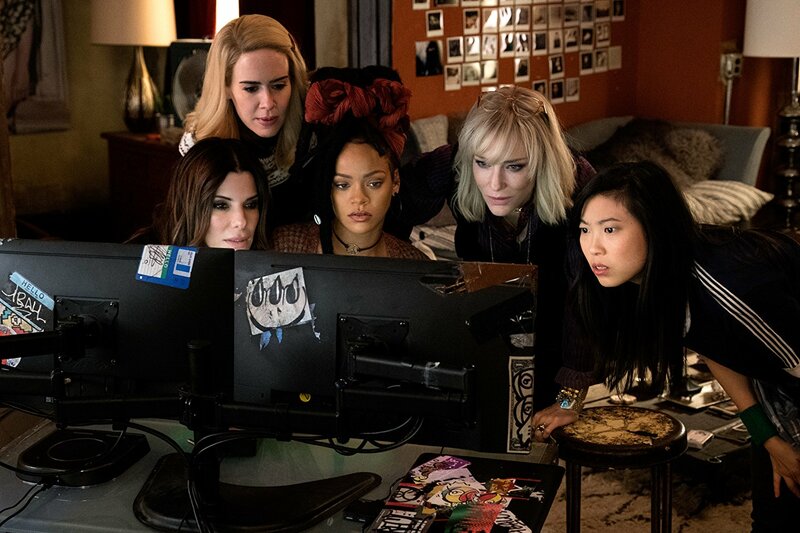 Lou recruits the likes of Rihanna's tech expert who is one of the few hackers that isn't Russian as well as Awkwafina's pick-pocket neither of which Debbie seems initially impressed with and both of which serve to exemplify the biggest weaknesses in this spin-off. In Soderbergh's films each member of the crew was an integral part of the heist-that much is still true here-what has changed is how well we get to know each of the characters involved and how much those individual characters are developed. As previously stated and what we'll delve into more here in a moment is how much more Bullock brings to the table than what seems might have existed on the page, but while Rihanna, Awkwafina, and even Kailing serve their purpose as far as plot goes their actual characters are little more than the skills they bring to the table; there is nothing beyond who these people are beyond those skills and therefore viewers are only invested in the job so far as if it is successful or not rather than being invested in whether or not these specific people are successful. Debbie, Tammy (Sarah Paulson), Nine Ball (Rihanna), Lou, and Constance (Awkwafina) watch with anxiety as their partners pull off part of their master plan. So, Debbie. Ms. Sandra Bullock. She had no need to bring in what was this unfiltered aspect to her character-a character that was christened into the church of criminality and made to live or die by how good she was at being cunning and conniving-also seems to be a person who is lost without a job to look forward to. This isn't exactly a revelation as most criminals-like adrenaline junkies-don't do these things or risk their lives, freedom, etc. for the sake of the outcome, but more for the thrill, the high of executing the gigs. With Debbie, there is this keen sense that she is well aware of her addiction and the ugly pattern it typically follows, but in one scene where she is both giving herself a pep talk and preparing a rousing speech for her troops she essentially reminds herself how much all of this is worth even if it doesn't go exactly as she imagined it the many, many times she went through it and revised it while in prison. 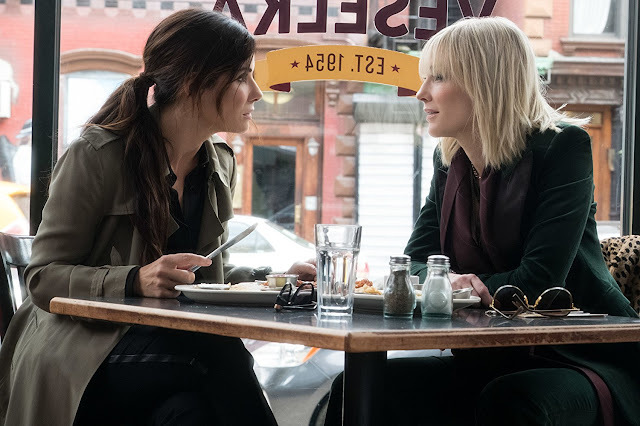 Like everything else in Ocean's 8 this scene isn't communicated with much weight nor does it contain any techniques that might suggest something more at play from a filmmaking standpoint, but rather it is a piece of a dialogue meant to serve as the calm before the storm where everything is neatly summarized before being put into action punctuated with a slight joke to ensure tonal consistency and yet Bullock brings this authenticity to the character; this sense that this is who Debbie genuinely is and can't help it even if she wanted to be someone else. She may or may not desire the life she satirizes in the opening scene of the film when pleading her case to the parole board, but even if what she said included a hint of truth there is more fear to let slip what she sees as the security her skills as a criminal provide than to ever have to try and actually make an honest living. Debbie's arc inevitably proves that she can indeed go on doing what she knows she's good at, but in giving this line that goes, "a him gets noticed, a her gets ignored and for once...we want to be ignored," there is this sense not only of what women's roles are in society and what they're expected to be, but such awareness of one's self and the inherent nature to adapt to mirror the people one surrounded by at any given point is a case of constantly feeling like you have to sell yourself. Why would someone constantly feel the need to sell others on themselves? Any number of reasons, but in the case of Debbie it seems to be this hope she might stumble upon something better, something more purposeful and in understanding she only has so much longer before she's stuck with what she was always destined for it's not hard for Debbie to embrace that destiny rather than take this moment to do something normal which, for her, would be quite difficult. 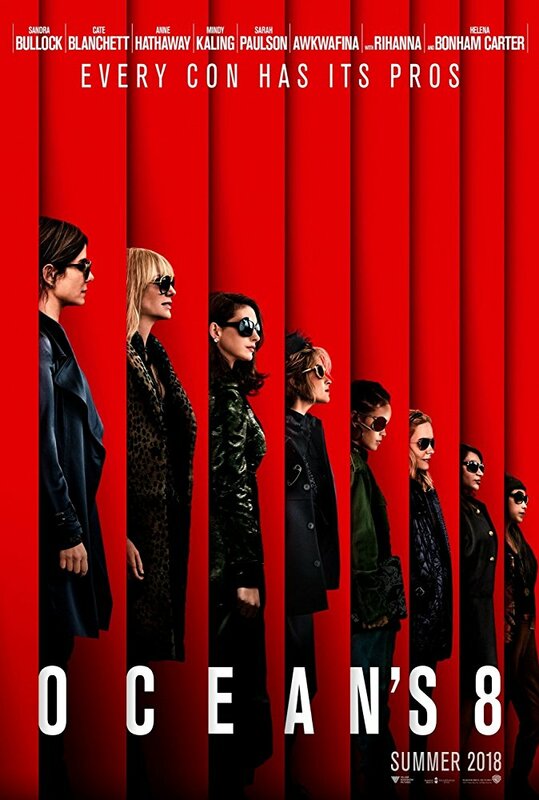 Of course, Ocean's 8 isn't really interested in following any of those paths or developing further as a character study, but more it is about having a good time and watching these gals steal some expensive jewelry with style to spare. In this regard, Ross delivers as he and his teams re-creation of the Met Gala is rather impressive if not for the host of cameos and clothes featured, but more for actually adding some palpable tension into the mix as each of these films has always hinged on the nitty-gritty of executing the master plans and Ross, his script, and his actors nail this part of the pre-requisites. Furthermore, while the cast of characters are more undercooked in some areas while more sporadically entertaining in others there needed to be more of an overall sense of camaraderie or at least better rapport between more combinations of these characters than what is on display in the final product as the aforementioned lack of characterization in some of these individuals leaves much to be desired. That said, and while Bullock is certainly the lead and provides whatever substance a movie like Ocean's 8 might have to offer, it is actually Hathaway who comes away with the most to gain as her performance here as a spoiled, catty, super diva plays up exactly what Hathaway herself has been accused of being over the past few years with it seeming as if the actress took this role and took full advantage of the opportunity to play Kluger so as to show what a true diva might look like and then shut every one of her haters and shamers down with what is a truly fun, versatile, and admittedly wild performance that gives the film that boost of energy and shot of rhythm it desired and needed to be considered akin to Soderbergh's trilogy.